With the regular deer season over, there are still plenty of opportunities for hunting trips to management ranches. We are blessed to have several of these ranches that support our efforts. One such is the Leona River Ranch. Below is our vice-president Billy Hodges’ report on a great trip for some very worthy Marines. I contend that the low brush country of deep south Texas is to deer hunting what the major leagues are to baseball. That being said, the Leona River Ranch would be its Yankee Stadium. The 7,000 acre Leona River Ranch is owned by Joe and Jackie Vardell of Anahuac, TX. The ranch sits astride Uvalde and Zavalla counties eight miles south of Uvalde. I was privileged in early February to take five wounded Marines from the Warrior Transition Unit at Camp Pendleton California deer hunting there. For three days, SSGT Matt Wheeler, CPL Brock Bigej, SSGT Tom Totter, SGT Stephen Lunt, and CPL Jess Rice traded formations, physical therapy, pain management treatment, and medical appointments for hunting, fishing, eating, and general relaxation on a scale than only the United States Marine Corps could achieve. Friday afternoon was spent at the range making sure all the weapons were dead on. Nyland Falkenberg, the ranch’s game manager, took Matt and Jess deer hunting after everyone had put several rounds down range. Tom opted for hunting Black Buck with guide Rick Balzumati. The rest of us spent the afternoon shooting sporting clays with Joe’s pilot Glen Goodwin and friend Ben Stefka on the ranch’s eight station sporting clays course. On about the fifth station we heard two rifle shots in the distance about a minute apart. They had the “boom-whop” sound experienced hunters recognize as solid hits. We cut the clay shoot short and headed down to the cleaning shed. Matt and Jess were smiling when we arrived, as they peered over the tailgate of Nyland’s pickup. Even from a distance, we could see the antlers protruding over the side of the truck. Matt shot a 9-pointer that scored 139 BC and Jess had a 10 that scored 143. A little after dark, Rick and Tom came driving up with a look of disappointment all too familiar to those of us accustomed to frustrating hunts. It seems Tom was about to close the deal on a trophy Black Buck when a fox decided he was going to play “spoil a Marine’s day.” He sent the antelope into warp drive. Oh well, there is always tomorrow. The evening meal was to die for! We had yellow fin tuna steaks cooked to perfection by the kitchen staff at the ranch. We all turned in early as it had been a long and exciting day. I got the troops up before first light, yelling “FORMATION.” The boys were none too happy about that. After coffee and a sweet roll, Tom went with Rick to resume his hunt for the elusive Black Buck that had given them the slip the evening before. Stephen and Brock headed out with Nyland in search of whitetail deer. I took Matt and Jess fishing for Rainbow Trout at the stocked lake behind the lodge. The trout were not biting well but Matt managed to catch one. We fared much better on bass and catfish, catching a dozen or so of each. By the time breakfast was ready the hunters were back. The morning had been a total bust for them. Nothing was moving. Tom saw his Black Buck, but not getting a good shot on the animal, passed and hoped for a better shot in the afternoon. After a fantastic breakfast we headed to another lake on the ranch for some more fishing. I have found that in all endeavors anything done with Marines or soldiers becomes a contest for them. They make a contest out of the simplest of things. Our fishing that morning became a contest of The Biggest, The Most, The Smallest, The Longest, One With The Most WHATEVER. Glen and I just sat back enjoying the scene that unfolded before us - five combat wounded Marines acting like little boys and enjoying a second chance at life. I think SGT Lunt won the biggest bass. Stephen suffered a severe brain injury when he was hit in the head with an ax by a Taliban fighter. Though badly injured, he fared far better than the Taliban fighter whose last thought was “I can’t believe I didn’t kill that guy”! SSGT Wheeler caught the biggest catfish. He is undergoing limb salvage on his left foot that was shattered by an IED in Afghanistan. SSGT Totter won the most fish caught. He suffered multiple gunshot wounds in Afghanistan. CPL Bigej caught the smallest fish in the shortest time. His legs were shattered and his body riddled with shrapnel on a dismounted patrol in Afghanistan. CPL Rice caught the biggest fish. He was wounded in a mortar attack in Iraq. Saturday afternoon found us at the trap range. Teams were chosen and wouldn’t you know it! I was NOT the last man picked. The teams were Stephen and Jess, Matt and Brock and Tom and me. The two losing teams had to clean the field of spent shells. At the end of the round Tom and I strutted away as the others picked up several hundred spent shells on the course.... Okay, I just made that up. No one had to pick up the shells, but Tom and I won. About 1500, the Marines that had not harvested an animal headed back to the field for more hunting. At 1700, I heard two shots in the distance. By the time we got to the cleaning shack Tom and Brock were already there. 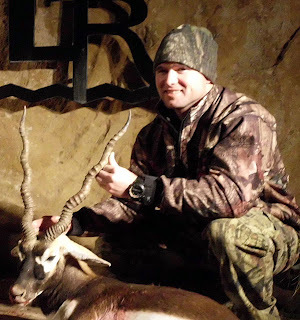 Rick had put Tom on a beautiful Black Buck with three and a half curls - a trophy by anyone’s account. Brock had a huge 15-pointer that scored 153 BC. Only Stephen had not yet scored an animal. The evening meal was rib eye steaks. After dinner, we played shuffleboard, shot pool and told stories well into the night. Lasting friendships were made at the Leona River Ranch that night. About midnight, all the guides huddled up to talk about Stephen and the next morning’s hunt. It was decided Stephen would go with Nyland and the others would hunt hogs. Rick yelled “FORMATION” way too early the next morning. However, Stephen was already up and ready to go. He and Nyland were already gone by the time I took a shower and walked into the lodge. Joe was there and we drank coffee and talked about deer hunting, politics and life. By my second cup, Joe’s phone’s text message ring went off. He looked at it and said SGT Lunt got his deer. The deer was in the high 140s. Those of us at PATRIOTS AND HEROES OUTDOORS are blessed to be able to take wounded warriors on absolutely incredible deer hunts. I am very proud of what our organization has accomplished in the last seven years. We have held hundreds of events and taken thousands of wounded warriors hunting and fishing. However, we could not do the things we do if not for men like Joe Vardell and his staff at the Leona River Ranch. Welcome to the team, Joe. Even though you don’t think so, you are as much a hero as any of the wounded warriors you have had on your ranch in the last two years. You see, heroes come in all shapes, sizes and forms. You don’t have to be Audy Murphy to be a hero. A hero is someone that changes lives for the better. Some might say that they change history. I say it’s changing the future. Think about it. The hero may not be the one that changes it directly but he may touch someone’s life that may change history. You sir, have done that. Southwest Airlines’ help has been invaluable to our ability to support wounded warriors. I would also like to thank Rick Balzumati and Refractory Construction Services for donating the shoulder mounts for this hunt. The guys really appreciate your support.